What springs to mind when you hear Orlando, Florida? Disney World, Universal Studios, Islands of Adventure, and Kennedy Space Center? Add those things up and what you come up with is really big $$$$! The average family of four can easily spend $2,000 a week on an Orlando vacation. That can be a huge deterrent to visiting the "City Beautiful." But as a local, let me tell you: there are ways to visit Orlando and do lots of exciting things for free, saving you travel dollars you can later spend on those expensive park entry fees. One of the best and biggest secrets is the free transportation available to all throughout the Disneyworld theme parks. It is no secret that the goal of the theme parks is to lure you and your credit card. In order to do this, they will very often provide some activities costing little or nothing to get you interested. And, believe it or not, Disneyworld offers the most. Disney property is huge, measuring 47 square miles! If you drive from park to park (there are 4 theme parks plus 2 water parks!) you would spend a good portion of your day in transit. In addition to the parks, Disney owns a wide variety of resorts. To accommodate their guests, the mega-amusement company offers free transportation between all of its parks and resorts. What the locals know is that anyone- not just Disney guests- can take advantage of that system. And, that system includes monorails as well as buses and boats. To take advantage of free rides throughout the park, drive your car to the Contemporary Hotel. Tell the parking and security guards that you are visiting the hotel, and unless you prefer valet parking, you will be able to park for free. Find your way to the Monorail Station located inside the hotel at the top of the escalator found on the 4th floor. If you are old enough, you will remember the Monorail as a C ticket ride at the "old" Disneyland. The Monorail actually passes through the hotel and offers stunning views. As you continue, you'll glide past distinctly unique resorts and obtain an elevated view into the Magic Kingdom as it carries you around the beautiful man-made lagoon. 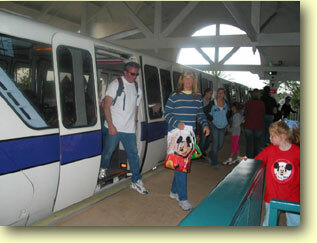 You may depart the Monorail at any of its stops and re-board after you finish exploring each resort. For a special treat, ask the attendant if you could be seated in the nose of the monorail. It can accommodate parties of 4. You may have to wait for a train or two, but it is worth it! Stop 1: The Transportation Center- It is here that guests enter parks from other parts of the transportation system. If you’d like to get a bird’s eye view of Epcot, transfer to the second train. It actually travels around Spaceship Earth and gives you a bird’s eye view into the park. If you discover the time for the fireworks and can time it just right, your monorail ride can bring you up close and personal with the spectacular aerial display! You can remain on the train for the return trip to the Transportation Center. Stop 2: The Polynesian Hotel- This is the oldest of the resorts at Disney World. It is faithfully decorated to reflect the Polynesian experience complete with squawky parrots near the lava flow inspired waterfall. Are you in the mood for a luau? This is the place to make your reservations- but bring money because that is NOT free. Stop 3: The Grand Floridian Hotel- This resort is an elegant reflection of old Florida but carries a strong resemblance to the Del Coronado in San Diego, California. Keep your eyes peeled for the two wedding chapels snuggled in the lagoon, complete with Franck’s Wedding Consultant Shop (based on Father of the Bride ). The Grand Floridian offers a wide variety experiences ranging from concerts on a full-sized Grand piano under the gargantuan chandeliers to a jazz quartet on the balcony overlooking the tea room. The Bird Cage Elevator, the kid-sized furniture and entertainment center, the white sand beach and waterslide make the Grand Floridian a fun place to kick back with a cool drink and people-watch. Keep your eyes peeled for the wedding parties in their formal finery reporting for their receptions in the exotic lobby. Inquire for the times for fireworks at the Magic Kingdom and arrive early onto the dock at the back of the hotel for a fabulous show. Also keep your eyes open for a fun electric light parade on barges in the lagoon. Stop 4: The Magic Kingdom- This is what California calls Disneyland. If you have chosen to spend your vacation dollars here, depart the train and enter the gates to the "Happiest Place on Earth" with more acreage than its sister property in California. If you remain on the train you’ll get a great eagle’s view of Space Mountain before you are returned to the Contemporary Hotel. A word to the wise- The winter months are actually the most interesting time to visit Disney World. First, the weather is drier, and it is a cooler time of the year in Florida. Another word to the wise- Christmas is the most popular time to visit Disney World! If you can arrange a visit before or after most schools are out for the holidays, the crowds will be smaller. The decorations are usually up shortly after Thanksgiving and through January. garbage bag will work in a pinch as it takes up very little space. *Bring a swimming suit- even in cooler weather, most hotels have heated pools. *Carry a bottle of water with you for each person. It is easy to become dehydrated in the tropics when the weather turns warm . *Bring your camera. Disney has provided multiple "photo ops" on it's property. 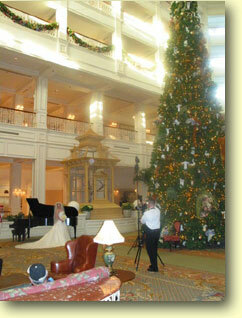 *Visit the Grand Floridian for the flavor of old Florida when the rich wintered there. Lounge in the lobby and listen to the huge grand piano or the orchestra on the balcony. Ride to the balcony on the ornate glass elevator and look down onto the huge chandeliers and the turn of the century scene below. Wander to the back deck in time to catch the fireworks and the Electric Light Parade. Walk along the beach to Franck's Bridal Salon and Wedding Chapels for a glimpse at one of the hundreds of weddings which take place there every year. Look for the horse drawn pumpkin coach or royal carriage in which the Bride and Groom may ride back to the Grande Floridian for their reception. *Visit the Polynesian Hotel to get a flavor of old Hawaii especially in the gift shop and Tiki Bar. Sit on the white sand beach to catch Florida's famous rays. Watch the wave runners and boats out on the lagoon. Catch a glimpse of the Tiki Torch runners at twilight and appreciate some of the most beautiful sunsets in the world. *Visit the Contemporary Hotel to view the magnificent, larger than life Small World themed mosaic murals which soar several stories high. Get your picture taken with the brass statue of Mickey and Walt in the lobby. Wander through the one-of-a-kind shopping deck as you watch the monorails sweep in and out of the building. Catch a glimpse of the Disney characters appearing regularly in Chef Mickey's Restaurant. 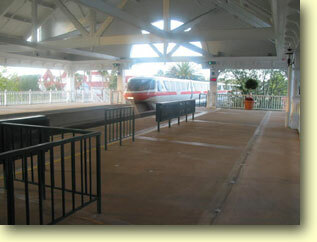 *Get off the Monorail at the entrance to The Magic Kingdom and walk the pathway which encircles the lake. It is formed of stepping stones which families have purchased while visiting the parks in commemoration of special events. It is fun to read the names to see if there is anyone you know. *Visit the concierge at one of the hotels to get the starting times for the Electric Light Parade presented on barges in the Seven Seas lagoon. Each hotel will know what time the parade is scheduled to pass its compound. Also ask for the time of the fireworks that night. The starting times vary with seasons. At the concierge desk in the hotels, you will find a small poster alerting you to all the activities offered in the hotel for the day. *Indulge in the popular quest for the "Hidden Mickeys". You will find the familiar ears worked into the landscape in the most unexpected places. Bring along a little notebook to keep track of the Hidden Mickeys you have spotted. Judy Daley works as an administrative assistant of computer services for Campus Crusade for Christ and lives in Florida. This article is her first in a series of family travel stories on Orlando.